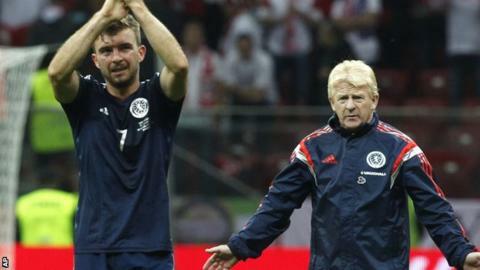 Manager Gordon Strachan believes Scotland's Euro 2016 qualifying group will go down to the wire. Following the pulsating 2-2 draw with Poland in Warsaw, the Scotland boss said Group D was proving a stern test. "I said it after the Germany game and this confirms it: this is the hardest group, this will go to the last day," he said. The Scots have four points from a possible nine and face Republic of Ireland next month. The Irish will be on a high after securing a shock 1-1 draw with world champions Germany on Tuesday night. In Warsaw, Krzysztof Maczynski opened the scoring for Poland before Shaun Maloney drew Scotland level following a superb counter attack. "Gordon Greer is fantastic. He looks nothing like a footballer; he looks like a rock star turning up at a testimonial game." Steven Naismith steered the Scots in front but Arkadiusz Milik's equaliser set up a barnstorming finish. The Poles and Republic of Ireland are joint top of the group on seven points, with Scotland and Germany three further back. Strachan conceded that he would have been content with a point in Warsaw before the game. However, he added: "As you've seen, our team said, 'we want three points' and they go a goal behind and still keep playing. "It was good, terrific, and it wasn't an easy surface. I didn't realise it was as heavy as that but I thought the smaller players kept at it. "They did a great job for us with and without the ball. "Over the last year, the rhythm to their game is good and their understanding. We know what to do when we get together. "I see patterns now getting played during the game so I'm really pleased with the performance and really pleased with their improvement. And so should Poland, I think they've really improved in the last six, seven months. "They were throwing everything at us in the last minutes. It was old-fashioned, just flinging the ball in the box and hitting diagonals. We dealt with it well because they're a tall, powerful side. "It was a draining game for everybody; I'm drained and I'm sure the fans are drained." Strachan was particularly effusive in his praise for his defence, especially Brighton's Gordon Greer, who replaced the injured Grant Hanley. "Gordon Greer is fantastic. He looks nothing like a footballer; he looks like a rock star turning up at a testimonial game. "And he's absolutely fantastic. I thought his partner [Russell Martin] did well and Steven Whittaker, you just put him on there and you know what you're going to get. "If you picked 10 Steven Whittakers then sleep would be easier the night before a game. He can't play in goal, that's why I said 10." Naismith expressed disappointment at being unable to hold on for victory but praised the side's "maturity and professionalism". Greer added: "I thought we played some great stuff at times. We were disappointed the second goal went in but we move on and we have a massive game [against Republic of Ireland] next month."